Base Notes: Honey, White Musk, Cedarwood, Sandalwood, Benzoin Resin, Tonka Bean Inspired by the Royal House of Marwar-Jodphur in Rajasthan. Vaara started life as the passion of His Highness Gaj Singh II who wanted to reflect his family?s deep love and connection with Jodhpur. Vaara offers a unique and beautiful glimpse into this aromatic world of the Maharaja. Perfumer Bertand Duchaufour?s journey to Jodhpur provided him with an abundance of inspiration for the fragrance and the end result, Vaara, cleverly captures the spirit of this fascinating part of India. Made in England. Beautifully boxed; 100ml / 3.4 fl oz Natural Spray. Vaara started life as the passion of His Highness Gaj Singh II who wanted to reflect his family?s deep love and connection with Jodhpur. Vaara is equally liked by both men and women. The fragrance begins with a delicious blend of coriander and carrot seeds, creamy saffron and juicy quince: ingredients discovered during his trips to local markets in Jodhpur. The heart of Vaara belongs to the gardens of Balsamand, the Maharaja?s summer palace, with two glorious roses blended elegantly with a billowing white note of Indian magnolia, a touch of freesia and a whisper of iris. The fragrance settles into a luscious combination of honey, white musks and resins dripping over an aromatic base of tonka, cedarwood and sandalwood. Inspired by the Royal House of Marwar-Jodphur in Rajasthan. Vaara started life as the passion of His Highness Gaj Singh II who wanted to reflect his family?s deep love and connection with Jodhpur. Vaara offers a unique and beautiful glimpse into this aromatic world of the Maharaja. 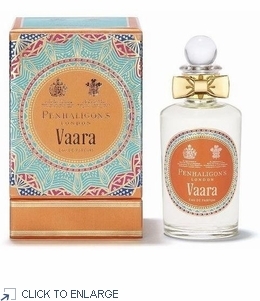 Perfumer Bertand Duchaufour?s journey to Jodhpur provided him with an abundance of inspiration for the fragrance and the end result, Vaara, cleverly captures the spirit of this fascinating part of India.